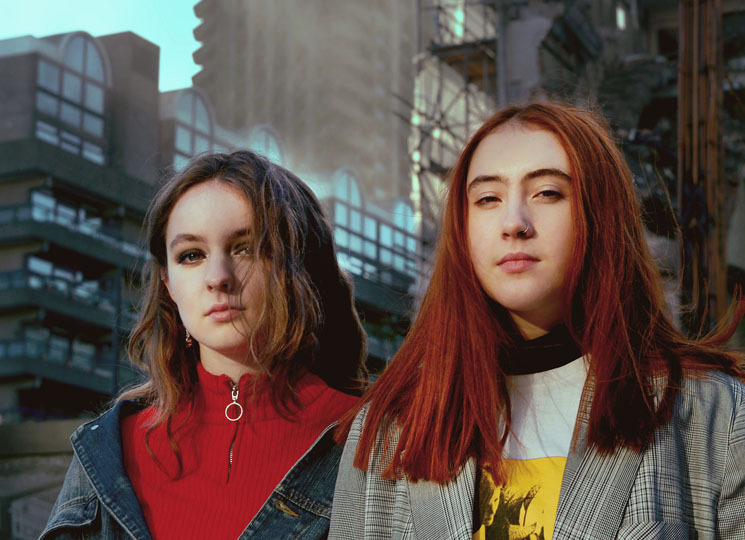 Stasis doesn't suit Let's Eat Grandma. On their first album, I, Gemini, the UK experimental pop duo wrote their own songs and played over a dozen instruments. When it came time to record a followup, though, life had changed drastically for multi-instrumentalists Jenny Hollingworth and Rosa Walton. I'm All Ears is the result of that shift, which included writing with software like Logic Pro X for the first time. "We never recorded demos," Walton tells Exclaim! "We just wrote songs and played them live, so it was a completely different process this time around, to write using technology. And I think that's important to keep our sound progressing, so we find new ways to write music." New approaches were unavoidable after the success of I, Gemini. Hollingworth and Walton played over a dozen instruments on that album, all before they turned 16. Despite that impressive feat, they still faced limitations, which in turn fueled their imagination. "I think when it comes to creating things, it's really important to have restrictions," says Walton. "I think that's one of the things we found when we were writing the first album. Looking back on it, it definitely turned out the way it did because of what was available to us at the time." I'm All Ears afforded the pair more opportunities, including the chance to collaborate with synthetic pop maestro SOPHIE and the Horrors' Faris Badwan. But Hollingworth says their new direction came with its own set of challenges. "With I'm All Ears, we didn't have the same restrictions, but we still had restrictions," she says. "We naturally end up doing the stuff we know how to do. There are still instruments that we don't know what we're doing on, so we can't use them in a certain way. So there were still some restrictions." While the duo wrote and recorded I, Gemini in their hometown of Norwich, recent touring demands have kept them away from the isolated English city for long stretches. They conceived I'm All Ears in transit, writing on trains and recording in places such as London, L.A., Stockport and Wales. As a result, they had little time to overthink their choices. "I think we let songs flow very naturally," says Hollingworth. "It was only by the end of the process, when we had most of the album, that we began to think of what was missing. We knew what we wanted to achieve with the songs, but we didn't overly conceptualize the whole thing while making it." That doesn't mean I'm All Ears lacks clear concepts. "Hot Pink" hints at the everyday aggressions of traditional gender roles, while "I Will Be Waiting" and "Ava" offer supportive messages for those grappling with mental health issues. For Walton, keeping these songs within the realm of everyday life was key. "We only write about things that affect us and our daily lives," she says. "I don't think we'd be able to write about [these issues] if we hadn't had direct experience with them." Walton adds that the pair made a more concerted effort to address social issues on I'm All Ears. Ultimately, though, she hopes that others can relate to Let's Eat Grandma's perspective. "With this record and all the music we write, we write it for ourselves," says Walton. "And I think that's all you really can do, write what naturally comes out. Hopefully, people will be able to relate to it as well."